A session is the time from when Firefox starts until it shuts down. A session can be very long-running. E.g. for users that always put their computers into sleep-mode, Firefox may run for weeks. We slice the sessions into smaller logical units called subsessions. daily, when crossing local midnight. This keeps latency acceptable by triggering a ping at least daily for most active users. environment-change, when a change to the environment happens. This happens for important changes to the Firefox settings and when add-ons activate or deactivate. On a subsession split, a main ping with that reason will be submitted. We store the reason in the pings payload, to see what triggered it. shutdown, when the browser was cleanly shut down. To avoid delaying shutdown, we only save this ping to disk and send it at the next opportunity (typically the next browsing session). aborted-session, when the browser crashed. While Firefox is active, we write the current main ping data to disk every 5 minutes. If the browser crashes, we find this data on disk on the next start and send it with this reason. general information: the date the subsession started, how long it lasted, etc. specific measurements: histogram & scalar data, etc. Latency - Sending a ping with all the data of a subsession immediately after it ends means we get the data from installs faster. 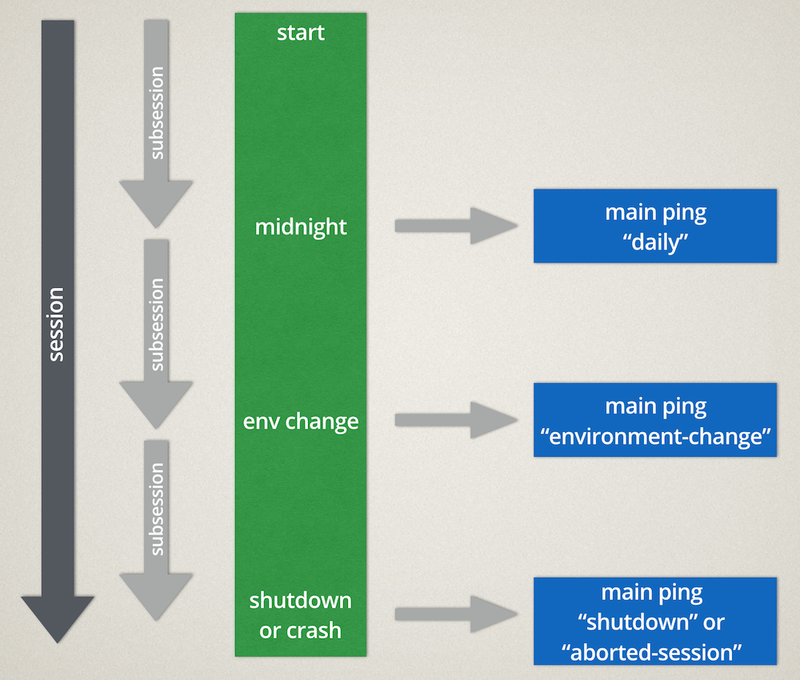 For main pings, we aim to send a ping at least daily by starting a new subsession at local midnight. Correlation - By starting new subsessions when fundamental settings change (i.e. changes to the environment), we can better correlate a subsession’s data to those settings.